While power rankings do not mean much in the middle of May, it does give an indication to fans about what so-called "experts" think of their team's offseason moves. Yet, nothing will be settled until the team's lineup on the field and battle it out. Additionally, there is always a surprise team that comes out of nowhere [Saints last year and Giants a couple years back] that jumps all the way to the top spot by season's end. So it is not exactly important where the Eagles start, but where they finish. In Peter King's weekly Monday Morning Quarterback Column on CNNSI.com, he has already ranked each team in the NFL. Holding the top spot is the young and upstart Green Bay Packers. King believes that the maturity of Aaron Rodgers and the emergence of Jermichael Finley means that the Pack the team to beat in 2010. The rest of the top eight rounded out with the San Diego Chargers [second], Baltimore Ravens [third], Indianapolis Colts [fourth], New Orleans Saints [fifth], Miami [sixth], New York Jets [seventh] and Carolina Panthers [eight]. However, King did included two teams from the NFC East in his top 10, but the Eagles are not one of the two teams. The highest ranked team from the division is the New York Giants, which came in at No. 9. "Pick a team out of the hat in this division," King wrote. "In the last six years, the NFC East champs, in order, have been Philadelphia, New York, Philadelphia, Dallas, New York and Dallas. The Giants have spent so much money and draft currency on the defensive line, and it simply has to be better or the natives rightfully will be able to wonder if Jerry Reese knows how to build a team, or did he just catch lightning in a bottle in his first year, the Super Bowl year. The offense will score enough, that I know. What it comes down to for the Giants is the defensive investment being smart enough, and I say it will." Most power rankings have the Dallas Cowboys in the top five, if not the No. 1 overall team, but King does not think that highly of the Cowboys as he ranks them tenth. Still, he adds the Cowboys have a fierce pass-rushing duo that no one else in the league can match and offense weapons all over the field for quarterback Tony Romo. "No other team has a better twin pass-rush threat than DeMarcus Ware and Anthony Spencer, and few teams have the multiplicity of weapons on offense. If Dez Bryant catches on quickly -- that's a big if -- the Cowboys could be the first home team to win a Super Bowl ever," King wrote. Although King stated that he would not be surprised if the Eagles somehow make the playoffs due to the way the division seems to always play out. "But something always happens in the NFC East, something weird. The Eagles could rebound with the energy of a new quarterback to make the playoffs, but I feel pretty good about a second team making the playoffs out of the division," wrote King on the wackiness of the NFC East. "For five straight years, the East has produced at least one Wild Card." As for the Eagles, King ranks them at No. 15. He envisions the team being in the hunt for a playoff berth and is the reason why the Eagles fall into the category of "playoff bubble" teams. 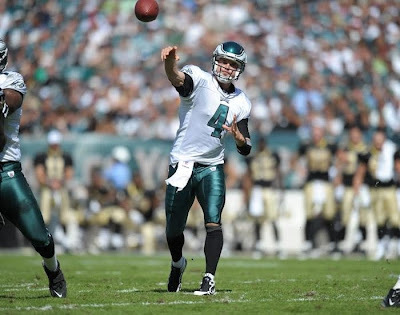 "I was in favor of going to Kevin Kolb, but that doesn't mean there's a 12-win season waiting to happen," he wrote. "There's likely to be growing pain, maybe with a Mike Vick replacement game or two." Rounding out the rankings for the NFC East are the Washington Redskins at No. 20. King has the ‘Skins in for a mediocre season [does think they will be in game due to quarterback Donovan McNabb], but expects big things from the Redskins in 2011. "The natives won't be thrilled with 8-8, but there's lots of deadwood, and deadwood attitude, to flush out of the organization for Mike Shanahan and Bruce Allen," King wrote. "If McNabb is his usual self, the Redskins will be in 13 games in the fourth quarter." Ultimately, there are a lot of questions and eyebrows raised about King's rankings. First, the Panthers have a unknown at quarterback in Matt Moore, but managed to sneak into the top 10. While Moore could be a good quarterback, playing and winning "meaningless" games down the stretch in 2009 does not mean he is on his way to stardom. In addition, teams now have a lot of tape on the young quarterback and an entire offseason to game plan for him. Additionally, the Jets who arguably had the best offseason in the whole NFL [on paper at least] would finish second in the division to the Miami Dolphins. A Dolphins team counting on Brandon Marshall not to be a distraction and an injured Ronnie Brown to return to form from a ACL tear. Furthermore, the Patriots or Vikings did not crack the top ten. If Favre returns [most likely will], the Vikings might posses the best team in the NFC and are definitely better than the Seahawks who are ranked 11th. In fact, Seattle could be the most overrated team in the rankings besides the Panthers. Pete Carroll has proven nothing as a NFL coach and has to implement an entirely new system in Seattle. Plus the quarterback situation is a giant question mark with Matt Hasselbeck coming off of a back injury and Charlie Whitehurst has never played significant minutes in the NFL. As for the Eagles, many fans and even players think the club is a legitimate Super Bowl contender in 2010 and will adamantly disagree with King's analysis. However, this might turn out for the best. Last year, King picked the Bears to go to the Super Bowl [failed to reach the playoffs] and had the Saints ranked 24th. As everyone knows, the Saints went onto win their first Super Bowl in team history. All in all, the Eagles are flying under the radar, but that is when Andy Reid and the team does their best work. He has the Chargers as 2 and the Panthers at 8? WTF? Was he drunk when he made these rankings?